Cumulative Bounce/Lag gains are now at 42.73% so far in 2019. Last week the S&P 500 Index gained 2.89%, while the five B/L Momentum picks gained an average of 4.98% when tight stop-loss orders were applied. All the picks this week are returning picks from previous weeks due to maintaining the highest B/LM scores. These picks are up an average +30.38% since first selection. Key Dow 30 stocks for this coming week are Visa (V) and Procter & Gamble (PG). Because the top momentum scoring stocks are sustaining such high multi-week and monthly returns in this model, the B/LM picks will be offered now every two weeks. The Bounce/Lag Momentum algorithm continues to be a very effective stock-picking guide. It is essentially a numerical derivative of the ratio of the percentage bounce from the 52-week low to the percentage lag from the 52-week high. As such, it is a sensitive positive momentum measure that works well to identify stocks that are at the upper half of their momentum trajectory. Bear in mind, however, that there is much more to successful trading than merely picking good stocks. I suspect that finding good stocks is only about 40% of possible success in equities trading. The remaining 60% is determined by money management and capital preservation. Decisions about entry and exit points and how long to hold a position are especially important. In today’s volatile marketplace, “buy-and-hold” strategies are unlikely to be successful. However, since we began forward testing of this algorithm by statistician Prof. Grant Henning, the stocks with the highest Bounce/Lag Momentum score have been systematically outperforming the market over much longer periods than weekly. As the top 5 highest scoring stocks for week 12 illustrate in the table below, this model is returning prior selections repeatedly to the top spot for sustained positive returns without any stop loss conditions. As with all good research studies, we have decided to use these discoveries to the advantage of our readers and recommend a longer average holding period for the stocks with top scores in this model. Also, the Winning Bounce/Lag Momentum report will move to a bi-weekly report that highlights the longer term success of this quantitative cross-sectional momentum model. 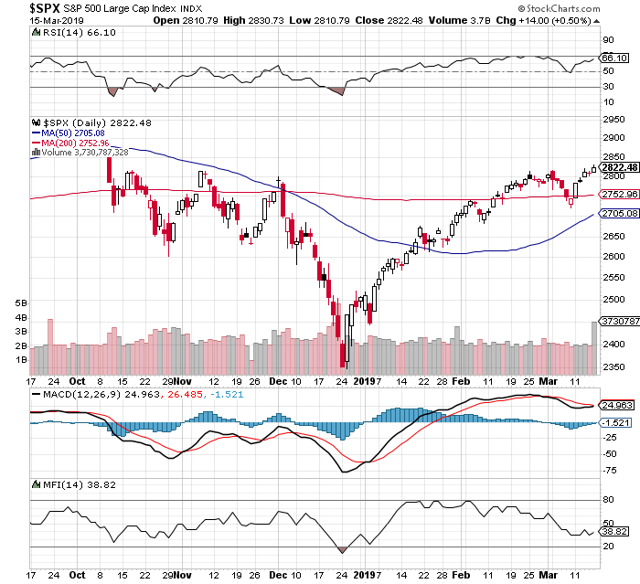 Due possibly to improved posturing by the Fed, hints of a trade deal with China and positive gains of last week, market conditions appear to be improving for next week. Four weeks ago, for the S&P 500 Index, the ratio of relative strength over money flow was only 0.96, where values below 1.00 are considered a portent of negative conditions. For next week that ratio has risen to 1.70, which is the highest in many weeks. I take this to be a strongly positive indicator for the near term. This past week the S&P 500 Index rose 2.89% for the week. You can see from the chart below that the S&P 500 Index has bounced off its 200-day moving average. The money flow index value of 38.82 shows that the money flow index is still in a low region where sharp upward bounces may be expected. 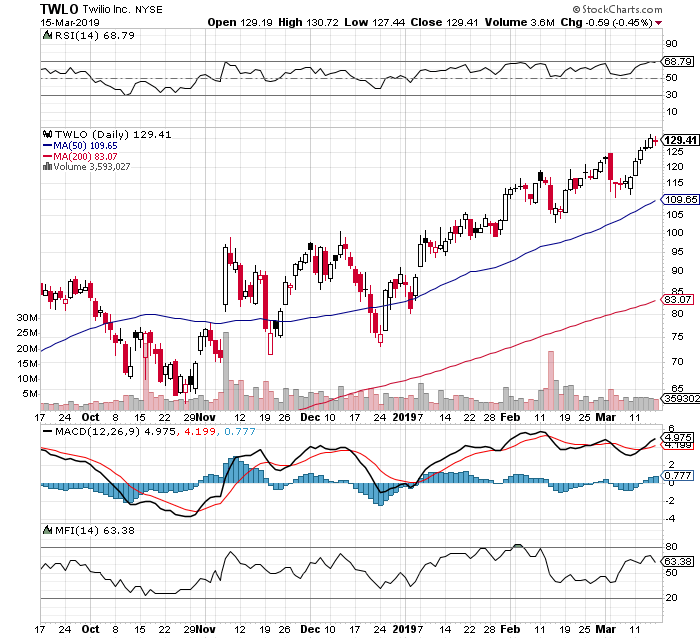 Last week’s five stock picks gained an overall average of 4.98% on the week. However, as the table below illustrates, this positive performance was possible only by using 2% trailing stop-loss orders. Otherwise, the overall averages showed a loss of 0.64% for the week. This underscores the need for a well-defined exit strategy in order to maximize success. During the same week, the S&P 500 Index gained a total of 2.89%. *A word is needed about the use of stop-loss orders. Formal stop-loss orders provide a temptation to market makers to “take out the stops” when there is little trading volume. Therefore, it is often better to set a mental sell price and execute it when the market reaches that point. Some of you have accurately noted that some of these picks that trigger a stop-loss sell return to favor within a few days. Therefore, it can be more profitable to avoid stop-loss sales altogether. I tend to err on the side of caution by preferring to suffer a small loss and to repurchase the same stock later than to suffer a large loss if the stock falls and does not return. 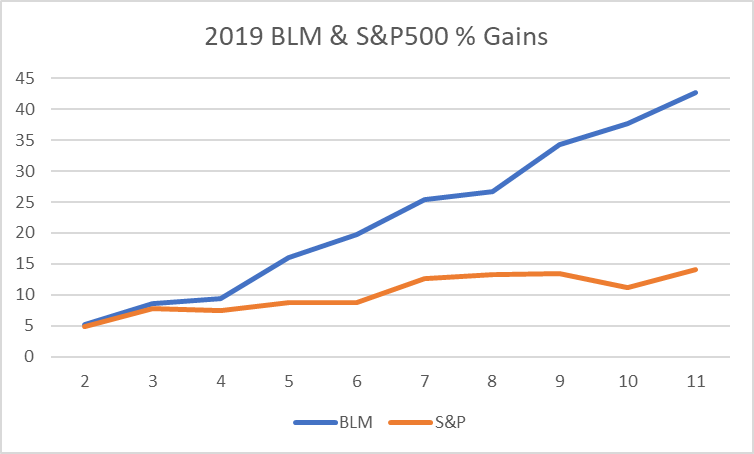 Another argument in favor of using stop-loss orders for these picks is that they all have already had big momentum moves and are somewhat “long in the tooth.” The BLM method identifies stocks with positive momentum only after they approach their 52-week highs. Thus, they are often vulnerable to sudden downturns, and capital preservation becomes a more serious issue than with picks made using other trading strategies. As you can see in the above table and chart, where the vertical y-ordinate represents percentage gain and the horizontal x-axis depicts number of weeks, the Bounce/Lag Momentum stock picks have more than tripled the performance of the S&P 500 Index. BLM average gains of 42.73% in eleven weeks have exceeded my strategic objective of 10% per month. While past performance is no guarantee of future gains, I remain optimistic going forward. Please note that I am not troubled by the seemingly high turnover rate occasioned by the use of stop-loss orders. An untold secret is that the proceeds from the early sale of those stocks can be applied elsewhere to produce gains not reflected in my cumulative-gains statistics. For next week, the BLM algorithm has identified the following five picks: TNDM, RARX, NVTA, RUBI, and TWLO. All of these stocks were picks from previous weeks and have gained over 30% on average from their initial selection with more room to run. Stocks from previous weeks often reappear when technical considerations so dictate. Note that a BLM score above 30 is still required to qualify as a weekly pick, but in challenging market conditions I tend to favor only the two or three stocks with highest BLM scores. The following table summarizes information on these picks and their qualifying highest BLM scores across the market. Charts of all of these picks are available below. 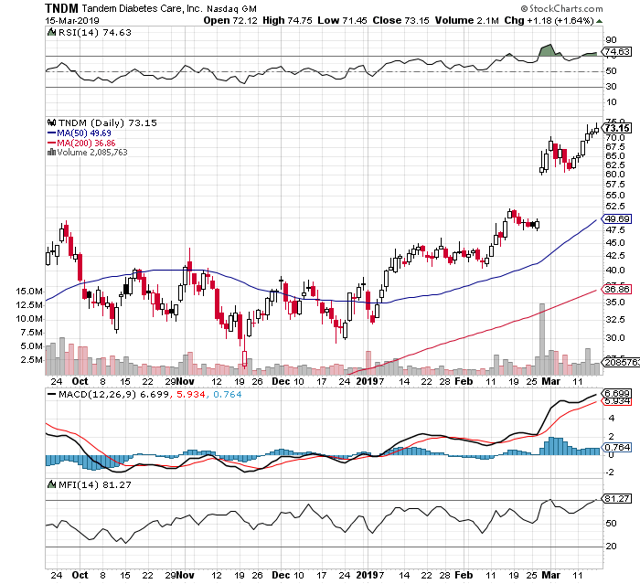 You can see from the following charts that all of these stocks are experiencing upward momentum surges and are reaching new annual price highs. However, it is precisely for those same reasons that extreme caution is warranted in each case. Tandem Diabetes Care, Inc. is a medical device company. TNDM is engaged in designing, developing and commercializing products for people with insulin-dependent diabetes. The company manufactures and sells three insulin pump products, which include t:slim Insulin Delivery System t:SLIM, t:flex Insulin Delivery System t:FLEX and t:slim G4 Insulin Delivery System (t:slim G4). Its technology platform features Micro-Delivery Technology, a miniaturized pumping mechanism, which draws insulin from a flexible bag within the pump's cartridge rather than relying on a syringe and plunger mechanism. It also features a software, which is a vivid color touch screen and a micro- universal serial bus (USB) connection that supports both a rechargeable battery and uploads to t:connect Diabetes Management Application (t:connect), its custom cloud-based data management application that provides display therapy management data from the pump and supported blood glucose meters. Recently the money flow index for TNDM (81.27) has exceeded its relative strength (74.63), which is usually not a good sign, but this stock has multiplied in value more than 22 times from its low in the past 52 weeks, and somehow it seems to keep on climbing. 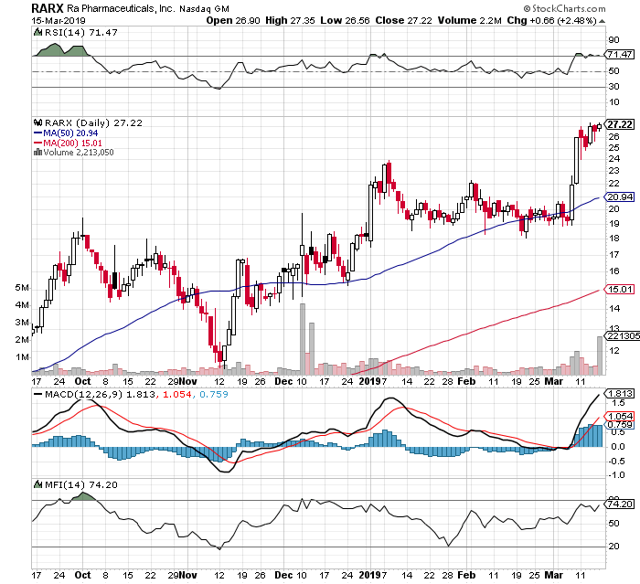 Ra Pharmaceuticals, Inc. is a clinical-stage biopharmaceutical company. RARX is focused on developing therapeutics for the treatment of serious diseases that are caused by excessive or uncontrolled activation of the complement system. It is developing its lead product candidate, RA101495, a self-administered subcutaneous (SC) injection. RA101495 is injected into the tissue under the skin for the treatment of paroxysmal nocturnal hemoglobinuria (PNH). The company is also developing RA101495 to treat other debilitating complement-mediated diseases such as generalized myasthenia gravis (gMG) and lupus nephritis (LN). It also focuses on discovery and preclinical programs targeting selective inhibition of other uncontrolled complement pathway factors to treat a variety of ophthalmic, renal and inflammatory diseases. The company uses its Extreme Diversity platform, macrocyclic peptide chemistry technology which produces synthetic macrocyclic peptides. Invitae Corporation utilizes an integrated portfolio of laboratory processes, software tools and informatics capabilities to process deoxyribonucleic acid (DNA)-containing samples, analyze information about patient-specific genetic variation and generate test reports for clinicians and their patients. As of December 31, 2016, NVTA's products consisted of assays totaling over 1,100 genes that could be used for multiple indications, including hereditary cancer, neurological disorders, cardiovascular disorders, pediatric disorders and other hereditary conditions. The company offers panels for a range of hereditary conditions in cancer, cardiology, neuromuscular, pediatric and rare diseases. The company focuses on genetic testing, genome network and genome management. The company offers full gene sequencing and deletion/duplication analysis as a standard for all of its tests. The company holds interests in AltaVoice, a patient-centered data company. the Rubicon Project, Inc. offers a technology solution to automate the purchase and sale of advertising for buyers and sellers. 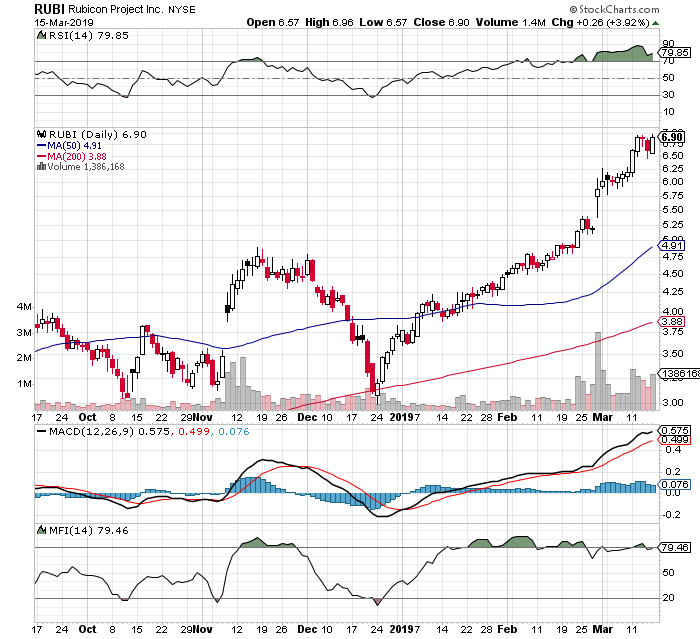 RUBI's solution enables buyers and sellers to purchase and sell a range of advertising units, including display and video; utilizing various inventory types, including direct sale of inventory and real-time bidding (RTB), and across digital channels, including mobile Web, mobile application and desktop, as well as across various out of home channels, such as digital billboards. The company's platform features applications for digital advertising sellers, including websites, mobile applications and other digital media properties, to sell their advertising inventory; applications and services for buyers, including advertisers, agencies, agency trading desks (ATDs), demand side platforms (DSPs) and advertisement networks, to buy advertising inventory, and a marketplace over which such transactions are executed. Twilio Inc. offers Cloud Communications Platform, which enables developers to build, scale and operate real-time communications within software applications. TWLO's platform consists of Programmable Communications Cloud, Super Network and Business Model for Innovators. Its Programmable Communications Cloud software enables developers to embed voice, messaging, video and authentication capabilities into their applications through its Application Programming Interfaces (APIs). Its Programmable Communications Cloud offers building blocks that enable its customers to build what they need. Its Programmable Communications Cloud includes Programmable Voice, Programmable Messaging, Programmable Video and Use Case APIs. The Super Network is its software layer that allows its customers' software to communicate with connected devices globally. It interconnects with communications networks around the world. 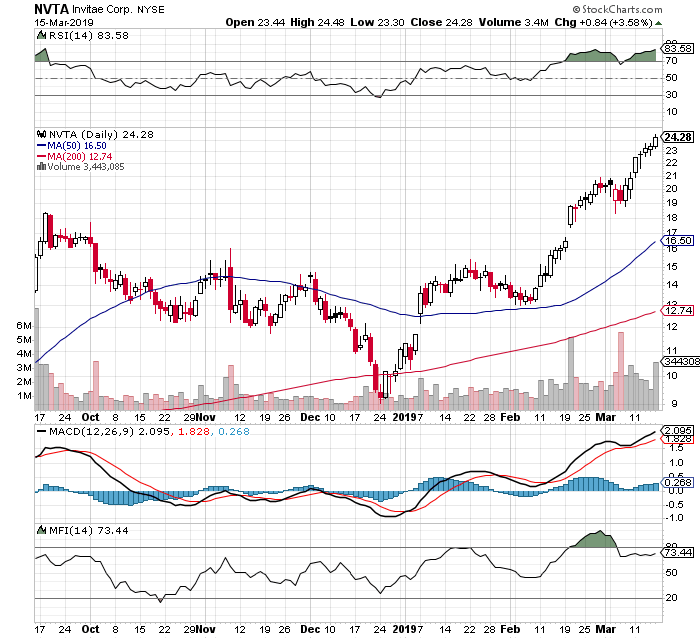 Many readers are especially interested in large-cap, low-risk Dow 30 stocks that experience low volatility and may also pay dividends. Traditionally I have avoided these stocks because they do not usually produce my targeted 10% monthly growth. However, this pattern of low-growth performance is not always the case. Also, it is apparent that there are safety advantages in popular large-cap stocks during periods of market volatility and potential downturns. However, most Dow 30 stocks do experience significant downturns in periods of market decline inasmuch as these stocks are highly correlated with overall market performance. Boeing (BA), my other pick for last week, was an unmitigated disaster, losing 10.31% on the week. Unfortunately, I did not foresee the latest crash and subsequent grounding of its premier new commercial jet planes. Although costs continue to escalate, I hope for a satisfying fix of the problems, which in turn could lead to a buying opportunity. Visa Inc. (NYSE:V) is a payments technology company that connects consumers, merchants, financial institutions, businesses, strategic partners and government entities to electronic payments. The company operates through payment services segment. The company enables global commerce through the transfer of value and information among the participants. The company's transaction processing network facilitates authorization, clearing and settlement of payment transactions and enables to provide its financial institution and merchant clients a range of products, platforms and value-added services. The company is a retail electronic payment network based on payments volume, number of transactions and number of cards in circulation. Its products/services include core products, processing infrastructure, transaction processing services, digital products, merchant products, and risk products and payment security initiatives. You can tell from the chart below that Visa has experienced a recent surge in trading volume. It also shows a positive MACD crossover pattern. 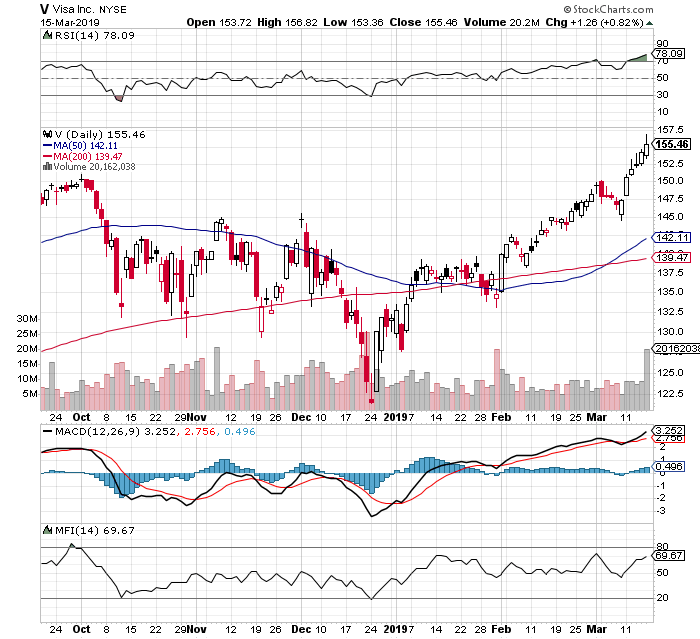 Better yet, its money flow index value (69.67) is substantially below its relative strength (78.09), which suggests that it still has room to run; although, the long tail up on the last candlestick pattern is not a near-term positive indicator. 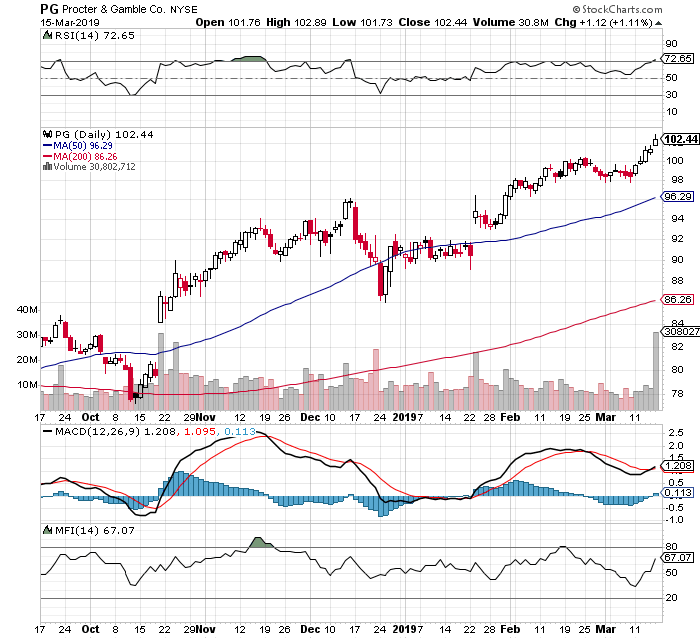 The Procter & Gamble Company (NYSE:PG) is focused on providing branded consumer packaged goods to the consumers across the world. The company operates through five segments: Beauty; Grooming; Health Care; Fabric & Home Care, and Baby, Feminine & Family Care. The company sells its products in approximately 180 countries and territories primarily through mass merchandisers, grocery stores, membership club stores, drug stores, department stores, distributors, baby stores, specialty beauty stores, e-commerce, high-frequency stores and pharmacies. It offers products under the brands, such as Olay, Old Spice, Safeguard, Head & Shoulders, Pantene, Rejoice, Mach3, Prestobarba, Venus, Cascade, Dawn, Febreze, Mr. Clean, Bounty and Charmin. You can see in the chart below that Procter & Gamble has experienced a recent surge in trading volume. It is also in the early stages of an MACD crossover pattern. Its money flow is also below its relative strength which usually is indicative of room to run. Although the BLM algorithm is a proprietary analytical procedure that is the end result of years of statistical analysis, much of its conceptual design is described in my books listed below. However, it currently involves the maintaining of a 100-column spreadsheet with daily updates including inputs from an AI expert system and a regression residual analysis. Use is made of rank statistics in the belief that a trader should not only find good stocks, but should also have a means of comparative ranking of those stocks. Computations proceed throughout each trading day, but these results are posted weekly through this medium. Subscribe now and learn many new models and techniques for short and long-term trading success. Now into our third year, this rapidly growing service has consistently outperformed the S&P 500 every single year with returns as high as 90% - even across different portfolio models.